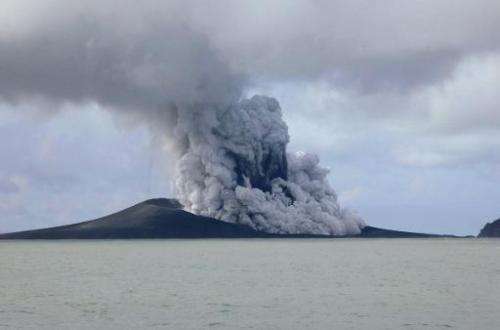 A Tongan volcano has created a substantial new island since it began erupting last month, spewing out huge volumes of rock and dense ash that has killed nearby vegetation, officials said on Friday. The volcano, about 65 kilometres (40 miles) northwest of the South Pacific nation's capital Nuku'alofa, rumbled to life on December 20 for the first time in five years, the Lands and Natural Resources Ministry said. 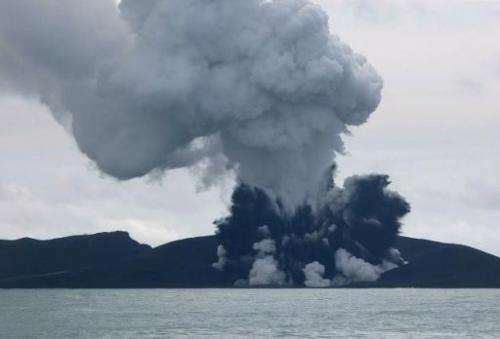 It said the volcano was erupting from two vents, one on the uninhabited island of Hunga Ha'apai and the other underwater about 100 metres offshore. "The new island is more than one kilometre wide, two kilometres long and about 100 metres high," it said in a statement. "During our observations the volcano was erupting about every five minutes to a height of about 400 metres, accompanied by some large rocks... as the ash is very wet, most is being deposited close to the vent, building up the new island." It said ash and acidic rain was deluging an area 10 kilometres around the volcano, adding: "Leaves on trees on Hunga Tonga and Hunga Ha'apai have died, probably caused by volcanic ash and gases." A number of international flights were cancelled earlier this week amid concerns about the volcano's ash plume but they resumed on Wednesday, with authorities saying debris from the eruption was not being thrown high into the atmosphere. Tonga, which is almost 2,000 kilometres northeast of New Zealand, lies on the so-called Pacific "Ring of Fire", where continental plates collide causing frequent volcanic and seismic activity.